Young IWRG rudo. Wrestled in Arena Aragon from 2008-2010. 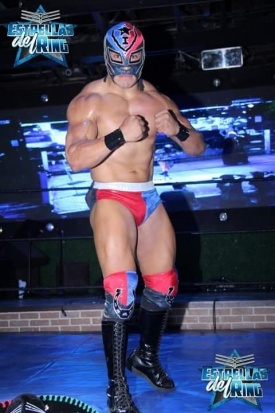 Debuted in Arena Naucalpan in 2010 in the FILL tournament as a luchador from an outside lucha libre school, but appeared to transfer to IWRG soon after. He won the IWRG El Protector tournament in 2012 with X-Fly. Started out with a Jamaican gimmick, changed to a caveman in 2013, reverted back to his old image after a few weeks. Since 2015 Imposible began his experience as trainer. All began by helping a friend with addiction problems and he invited his friend to retake his trainings, and then more fellow wrestlers joined. He began attending Center Plaza where there was a ring, he received an schedule. Then with Kendo, after that the Bulls Gym reopened now known as Valiente Gym and he also instructs at Gimnasio Koncreto. He likes teaching lucha libre, something that not anyone does. He trains even if there is only one trainee. He does this for discipline and love for the sport.